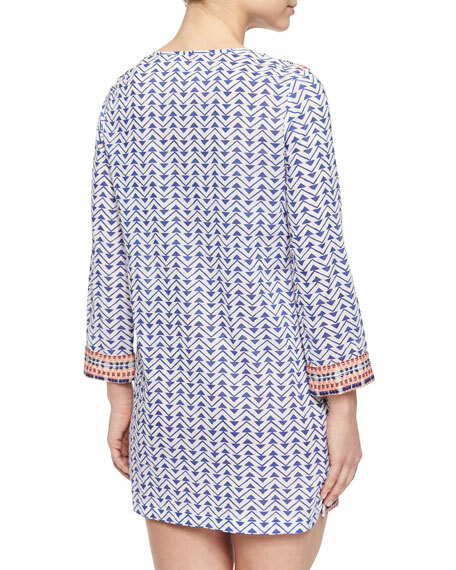 Soft Joie "Daria" dress in lightweight geo-print gauze. Notched V-neckline with tassel ties. Embroidery details at shoulders, cuffs and hem. Soft Joie, introduced in 2010, extends the Joie collection even further into understated chic. Look for casually luxurious interpretations of closet staples such as soft tops and tanks, skirts, and cardigansperfect for layering every month of the year. For in-store inquiries, use sku #143691.